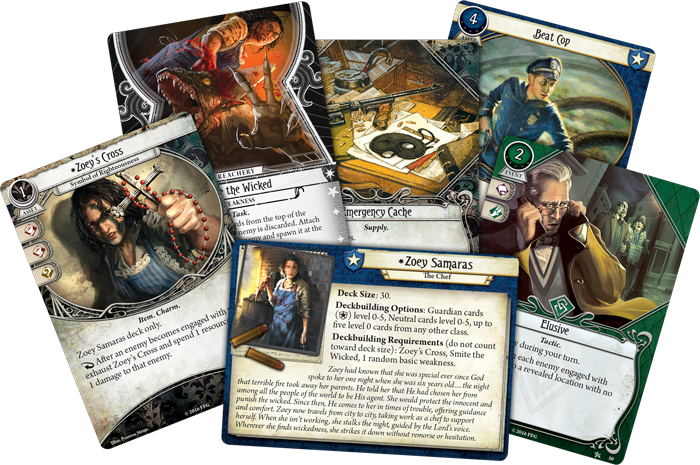 Enjoy the ultiamte Arkham Horror Living Card Game expierience on Tabletop Simulator! Added The Secret Name and The Wages of Sin mythos packs! Automatic scenario construction! Thanks to memory bags, setting up each chapter will take you only seconds! Added stackable chaos token drawing (right click), encounter discard reshuffles and draws if no cards are left in the deck, clue and resource tokens no longer re-spawn upon loading, and TCU deluxe expansion updated to "clean" HD version. High resolution playmats for investigators: These include fully scripted functions such as chaos token & encounter card automatic draw and discard, automatic resource token spawning when assets are played onto the mat, damage + horror + resource tracking with clickable token spawning. NOTE: Settings/Game needs to be on full physics for the chaos token drawing script to work properly. High-res and custom-made playmats for the main play area, victory display and scenario cards with pre-placed magnet snap points for easy placement. Automatic clue spawning when location cards are put into play. Automatic chaos bag setup with clickable difficulty selection cards included in each scenario. Easy deck building via Arkhamdb.com and Grabben's Deck-builder! Browse ArkhamDB for your favorite deck, copy its # from the URL, input it into the builder and isntantly build your deck! All campaign guides included in easy-access tablet objects within each campaign box. Campaign logs for each main campaign also are included. Cards arranged by xp cost, class and type for easy overview and deck building / upgrading! All investigators from core + expansion sets, as well as 4 additional promo investigators included. All investigators organised by class, expansion and all come with a pre-created base starter deck so you can grab and play right away! Custom two-sided investigotor and class tokens included to track your actions and turns. Official Rules reference, Learn To Play and deck builder guides included for quick and easy reference. Recreate agenda, act, location, set-aside and encounter cards into HD decks with clean art. Recreate all playerand weakness cards into HD decks with clean art. Icekobra, OPKEnobi, Reaps, Tigrezno, PunkOrange, callofAS, Noaloha, Ramassmieth, Crichton, PiEater, voky, Goeki, MrDodger, kirstospower and any anyone else I may have missed crediting. Lifenoodles for taking care of all the scripting work! And of course special mention to Fantasy Flight Games for making such an awesome game - if you think its fun in TTS, wait til you try it in RL! Support FFG and purchase the originals! All card images, original game assets and instructions property of Fantasy Flight Games. The weakness decks are on the left hand side, click on the Lovecraft token to draw out the weakness decks, shuffle the "All weakness" deck and draw a random card. Alternatively, if you build your deck on ArkhamDB.com and import it using the deckbuilder in the mod, it will add a random weakness automatically for you. Yes!!!! FFG is finally going outta business! Hooray! Mod updated! The Secret Name and Wages of Sin have been added, both scenarios included with auto-setup, auto token spawning, and all new player cards also included in the usual places. Also a few bug fixes and setups have been updated, and the deckbuilder should import some mis-named cards properly now. also, does the technobablbe about denoising pictures mean that we will get color.corrected card images soon ? That'd be awesome, some mystic cards' borders look puple-pinkish, some purple, some, purple-blueish and so on. Fantastic work on the auto setup. @rover_27 https://discordapp.com/channels/225349059689447425/225349059689447425 I forget how you get permission to join (if its even needed), but i suspect google would tell you if that link doesnt work. Splattface: Thanks for the tip, almost done with the new new update, just need to go through all the bugs and make sure clue and resource tokens spawn correctly on all the new cards from the new mythos packs! Will probably update sometime tonight. Hey Dran, awesome table. Just letting you know that Minh Thi Phan's starter deck has all of the survivor cards replaced with rogue cards. Hey Andy, could you please share a link to discord server?